CHARLOTTETOWN, PEI - An innovative new children’s program got its official launch here today in a school gym packed with kids and parents and government, education, health and community officials. Called “Smart Start”, the program is a unique partnership between the Eastern School District, Prince Street School, Public Health Nursing, Holland College, the University of PEI and CHANCES, a non-profit community agency. Operating out of two inner city locations, the program reaches out to local families offering a full day/full year child and family program that includes pre-and post natal resources, nutrition counselling, an early development program for infants and toddlers, school-based pre-school for two to four year olds, and child/parent activities, resources and information. 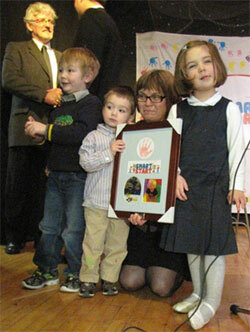 Jane Bertrand accepts plaque on behalf of Margaret McCain from young members of Smart Start, PEI. Jamie Gill’s son Hudson attends the preschool program at Prince Street School. “The fact that the program is in our local school is wonderful because our older son attends the same school,” she says. “At Smart Start we meet other parents and the staff are always there with helpful parenting tips,” adds dad Wendell Burke. The Smart Start partnership is the tenth program in Atlantic Canada to receive support from the Margaret and Wallace McCain Family Foundation. A three-year grant of $300,000 helps support start up costs and funds research into the model. The Foundation wants to demonstrate to policy makers and the public the value of transforming the current service patchwork into an effective early childhood system by combining the resources of public health, family support, child care and kindergarten. Aligned with the public school system and operated within a provincial framework these full service centres are best practice models in early childhood programming, policy and system design. 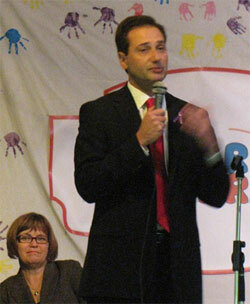 Premier Robert Ghiz welcomes the official launch of Smart Start PEI. Research and development for the project is supported by academics from Holland College and the University of PEI. “This is a tremendous opportunity to pilot a model of best practice in Prince Edward Island that meets the needs of young children and their families and is solidly based in the most current research,” says Ann Robertson, Executive Director of the CHANCES Family Centre.